Actions & Gestures & Postures, Oh My! The one characteristic these practices all seem to share is their ability to turn us away from the mundane, the worldly, the everyday, and direct us toward the sacred, the transcendent, the eternal permeating our world, leavening it, making sense of it. A Simple Bow: Simply lower your chin toward your throat and hold a moment. When: Any time you hear the name "Jesus;" when the Cross moves in procession; and any time you hear "Father, Son, and Holy Spirit" mentioned together. A Solemn Bow: Bow at the waist (about 30 degrees) and hold for a moment. When: At the Aspérges when the priest sprinkles the congregation with holy water; when the server censes the congregation during the offertory; traditionally during the Nicene Creed from the words "For us and for our salvation" to the words "and was made man;" during the singing of "Holy, Holy, Holy Lord, God of power and might. Heaven and earth are full of your glory. Hosanna in the highest" in the•Sanctus. 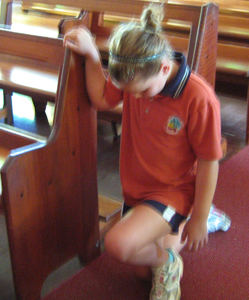 A solemn bow may also be made before entering the pew as a sign of respect. Genuflection: Looking at what you are genuflecting toward, kneel on your right knee for a moment, bringing the right knee all the way to the floor, close to the heel of the left foot, keeping the back and neck erect. Hold for a moment, then stand. When: Genuflect toward the Tabernacle where the Blessed Sacrament is reserved, and each time you pass in front of it (except when you're in procession, such as standing in line for Communion, or returning to your seat afterward); instead of the solemn bow before being seated. The Cross of Jesus Christ leads us throughout our Christian life; the Cross also does so in the liturgy. When walking around [we call it a Procession], the Cross leads us. We follow. And even when we are not literally walking behind the Cross, we participate in the processions by standing and turning to face the Cross. When the Cross passes by where we are standing, we bow in respect, then continue to face the Cross. "Child of God, you are sealed by the Holy Spirit in Baptism and marked as Christ's own forever." Those words are spoken at Baptism as a cross•is marked upon the newly Baptized. By the cross we are saved. Under the•cross we live. In the cross we receive God's promise. In all the Christian world there is surely no religious action so noticeable or so compelling as that of making the sign of the cross. then the other shoulder ("...for my salvation."). On entering the church, dip your finger into the water basins [know as stoops] by the doors, then make the sign of the cross. This is done in remembrance of your baptism. The sign of the cross can be made at the beginning and•end of private prayer, the Invocation of the Father, Son and Holy Spirit at the beginning and ending of the liturgy, and at Holy Communion. Traditionally in the liturgy, the sign of the cross can also be made at the last line of the creeds, and during the singing of "blessed is he who comes in the name of the Lord" in the Sanctus ("Holy, Holy, Holy"), and whenever the cross symbol is seen in the liturgy. The Book of Gospels is carried in Procession to the place where the Word of the goods news of Jesus Christ is proclaimed to the people. We turn to face the place where the Gospel is read. When the reading is announced, it is appropriate to trace a cross with your thumb on your forehead, on your lips, and over your heart. This is to remind us that God's Word is to be ever on our minds, in our words, and in our heart. 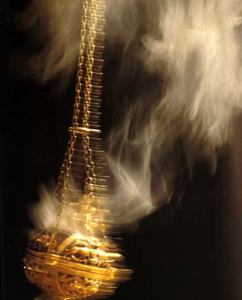 The use of incense is quite common in the world's religious traditions. God created all our senses, and we use them all in praise of our Creator. In Judaism, incense was included in the thanksgiving offerings of oil, grain, fruits, and wine (Numbers 7:13-17). The Lord instructed Moses to build a golden altar for the burning of incense at the meeting tent where the ark of the covenant was kept (Exodus 30:1-10). The purpose of censing and the symbolic value of the smoke is purification and sanctification. The smoke symbolizes the prayers of the faithful drifting up to heaven: the Psalmist prays, "Let my prayer come like incense before you; the lifting up of my hands, like the evening sacrifice" (Psalm 141). The Book of Revelation describes the heavenly worship as follows: "Another angel came in holding a censer of gold. He took his place at the altar of incense and was given large amounts of incense to deposit on the altar of gold in front of the throne, together with the prayers of all God's holy ones. From the angel's hand, the smoke of the incense went up before God, and with it the prayers of God's people."